Civic Nebraska's year-end fundraising effort ensures our democracy-building efforts enter 2019 strong. A generous donor is matching the first $5,000 we raise, dollar for dollar -- so donating early will double your gift. Happy holiday season! If you took advantage of Black Friday, Small Business Saturday or Cyber Monday deals this year, here’s your chance to pass along those savings to your democracy on Giving Tuesday. Democracies don’t build and sustain themselves — they’re only as strong as the confidence in and vigilance of the people who make up and participate in them. Civic Nebraska works every day to protect our democratic ideals, institutions, and norms through our Voting Rights, Civic Health, and Youth Civic Leadership initiatives. We saw many successes in the past year. But we’re already preparing for a monumental 2019. In the New Year, we will fight at the Nebraska Legislature to expand voting eligibility to Nebraskans who are unnecessarily and unfairly disenfranchised. We’ll also expand civic engagement resources and training in Greater Nebraska. And we’ll roll out new summer programs for our outside-of-school youth programs that build the next generation of civic leaders, among other new initiatives. 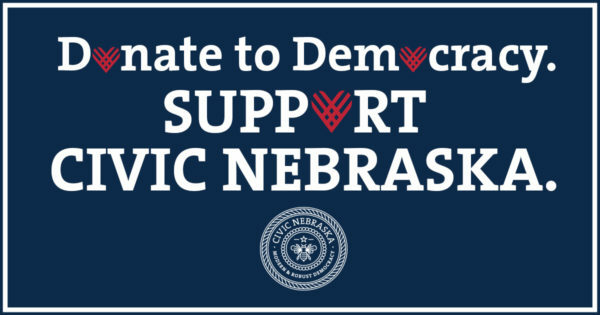 That’s why on Tuesday, Nov. 27 – Giving Tuesday – Civic Nebraska is launching a year-end fundraising effort to enter 2019 strong so we can ensure a more modern and robust democracy for all Nebraskans. A generous donor is matching dollar-for-dollar the first $5,000 we raise, so donating early will double your gift. All gifts are tax-deductible and will go directly to supporting our democracy-building programs and efforts. If you are making the donation as a holiday gift in honor of that friend, family member, or loved one who has everything, let us know by emailing us at info@civicnebraska.org. We’ll be more than happy to send you an official Civic Nebraska gift card signifying your gift in your loved one’s name. We’re looking forward to 2019 and redoubling our efforts to build a modern and robust democracy for all Nebraskans. That means bringing civic education to more Nebraska students and building a more engaged, informed society. That means defending Nebraskans’ voting rights at the statehouse, and increasingly fostering new community connections to build up our cities, towns, and neighborhoods. All of this happens because of your time, energy, and support — democracy can’t happen without you. That’s why we like to say: You are Civic Nebraska.